Jewish cemeteries are fascinating places. I was in one this morning, and noticed this gravestone. It's the final resting place of Chaya Sarah Safra, who died in the winter of 1957, nine years after Jerusalem had been divided. 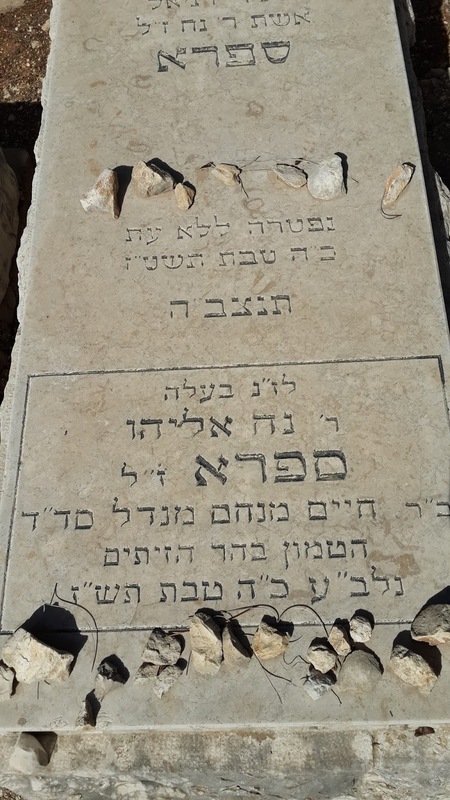 In all those years she had not been able to visit the grave of her husband, Noah Safra, who had died ten years (to the day!) earlier. He was buried on the Mount of Olives, which in 1957 was in Jordan. Her family buried her in the main cemetery of West Jerusalem, Israel. Resting in one city but two hostile countries, her gravestone contains all the information from his, so that visiting her might be a bit like visiting them both; and resting separately might be a bit like resting together. The Jews have been around for quite a while now - 3,000 years, give or take half a millennum and depending upon whom you ask and what criteria you use for "Jews" and "around". If you tried to list the Top Ten events in their history, the list you'd end up with might say more about you than about them. Torah at Sinai? Disliking that Jesus fellow back on Passover that year? Rebbi orally editing an oral tradition? Lobbying Cyrus? David penning Psalms? The Baal Shem Tov shaking things up? Abraham haggling with God about Justice? Spinoza laying philosophical foundations for the Enlightenment? When you get into recent history - say, 1750 onwards - things get even trickier. The emergence of secular German-speaking Jewish thinkers is probably on the list; should Refael Lemkin convincing the UN to outlaw genocide be on it? For that matter, is the Holocaust a Jewish event, and will it look as important in 2045 as it did in 1995? The top event on my list for the Common Era is easy: the 28th day of Iyar, or June 7th 1967, the day Israel gained control of the entire city of Jerusalem including all of the Old City. It's not a normal event when a group of people spend 1,897 years vocally waiting for an event, which then happens. I'm not aware of anything remotely similar having ever happened anywhere, anytime, with any other group. This evening is the 28th of Iyar, Yom Yerushalayim, Jerusalem Day. We celebrated it at our shul in an unusual way, by celebrating Baruch's 90th birthday, which also happens today. I wrote about Baruch back when he was a young 85. At 90 he still identifies primarily as the grandson of Rav David W, the chief rabbi of their Slovakian community. A Holocaust survivor, who fought in Israel's War of Independence and then spent 10 months as a POW in a Jordanian camp. One of the speakers this evening recollected stories about his service as a tank crewman in the Sinai War of 1956. Much of the congregation came to celebrate with him this evening, as he is universally regarded as second in importance only to the Rabbi, and he's the more obviously beloved of the two. (Rabbis inevitably have critics because they take positions on matters). He was surrounded by his family: children, lots of grandchildren, lots and lots of great-grandchildren. It was the most natural and miraculous event imaginable. One of two survivors of a death march on which 2,000 people perished, celebrating his 90th birthday in Jerusalem. Geopolitics, world history, wars, national interests and international cynicism, statesmanship and diplomacy, terrorism and hatred, law, international law, justice, injustice, propaganda, public relations, politics - these and many others are all part of the contemporary story of the Jews and their City. At times, however, a simple birthday party will trump them all with the force of its truth. I took this snapshot recently near the Israel State Archives (you can see a sign pointing to us in the upper left). It shows the sign on a truck advertising the driving school from which it hails: Hanan's Driving School. In Hebrew and in Arabic. Hanan is an equal opportunity fellow. He'll teach whoever pays him to learn how to drive a truck. 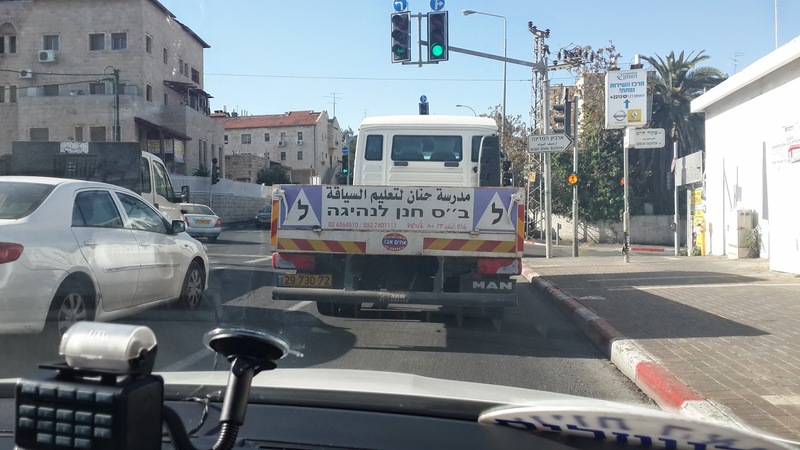 There are lots of folks in Jerusalem who speak lots of languages, but he advertises only in the languages of those who are likely to want to drives trucks. Hebrew and Arabic fit that bill, so those are his languages. Not Russian (they speak Hebrew by now), not French or English (they probably don't speak Hebrew well, but nor do they drive trucks), not Yiddish ('bal-agulehs' are an extinct breed). Hebrew and Arabic. Oh by the way: the sign directing traffic to the Israel State Archives is in three languages: Hebrew, Arabic and English, in that order. The neighborhood pool just happens also to be the only full-sized Olympic pool in Jerusalem, and we've got some active swim-teams. Yesterday evening as I was preparing for my swim, there was a gang of teenagers from the team who were showering and dressing. Most of them happened to be Arab teenagers, tho some were Jews. At one point three or four of them were standing near me and I eavesdropped. Only one of them was Jewish, and they were talking about the matriculation exams they'll all be taking in the next few weeks, as they finish high school. The Jew, it turned out, had chosen to take the easiest version of math, and his chief interlocutor was poking gentle fun at him. "Of course it depends on what you intend to do afterwards, but don't you think you should at least try for the intermediate level, not just the easiest?" Two of the others launched into their own discussion, in Arabic, about which math credentials it's best to strive for. This banal discussion would have been inconceivable in the first decade after Israel annexed Jordanian Jerusalem in 1967. As recently as 10 years ago it would have been conceivable, but not possible. Things are changing in Jerusalem, under our noses but also under the media radar. After my swim and shower, there were two fellows in their mid-30s chatting as they dressed. They were discussing the hardship of living a mostly sedentary modern work-life, and then going off for three weeks in the infantry and being called upon to make physical exertions that were easy 15 years ago but not anymore. So are the Jews a religious community or a nation? And if a religion, how can secular folks call themselves Jews? And if a nation, how come all members must profess a particular religion? And why can’t the Jews just be simple and clear about these matters, like everybody else? Far be it from me to resolve these weighty questions. Yet a magnificent book I’ve just completed made me look at them from a new perspective. It’s a 1,600-page book in Hebrew, with hundreds of quotations in Mediaeval Hebrew or Talmudic Aramaic-with-Hebrew, and it was first published in 1973; the copy I own has been sitting patiently on a shelf for more than 30 years, waiting for me to find the opportune time; when I finally did one of my considerations was to pay respect to the author during the first year after his death: Menachem Elon, once the 2nd highest justice in our Supreme Court. The book is his magnum opus, Hamishpat Haivri, Jewish Law. His thesis, presented in the first of the book’s three sections, is that between the end of Jewish sovereignty in the Roman era, and the end of Jewish cultural autonomy at the beginning of the 19th century, the Jews maintained a national legal system, and lived according to its rules and practice. This was no mean feat. With Jewish communities spread from Persia in the east to Iberia and England in the west, and from Yemen in the south northwards all the way to the Baltic, throughout the entire 2,000-year period no travel or communications ever went faster than walking, or perhaps rarely horse-riding. Legal decisions routinely took a year to arrive. Then there was the matter of varying political jurisdictions: the Jews shared one among themselves, but were spread over many different external ones. Language was an issue, since for most of the period Jews didn’t share one spoken language, nor did they maintain one language over the entire period in single communities, so their legal system used Hebrew, a language all knew and few spoke. Finally, there was the matter of the form of writing: for most of the period the only ways to record an idea and transmit it was by memory or handwriting. The printing press wasn’t around yet, and an author had to write his treatise by hand, and have it laboriously copied by someone else’s hand. A student interested in reading two items deciphered two handwritings; a student interested in, say, 500 items, read 500 handwritings. By the time the printing press did get invented, there were thousands of items, some of them very lengthy books, which a scholar needed to have read, in thousands of handwritings. Assuming he could get his hand on all of them, an unlikely assumption, and assuming a dramatic relevant new one hadn’t been written in the past decade but without having yet reached his town, a likely assumption. There was also the matter of persecution. It’s admirable to see how Elon never puts the persecution up front, yet it keeps on intruding, when scholars had to flee to other countries, or centers of learning were disbanded or ancient communities destroyed. The low-key, matter of fact mention, usually in passing, of an intruding calamity, underlines the extent to which the Jews never allowed persecution to serve as an excuse for collapse or retreat into disorder or even to halt their creativity in its shadow. So in the first section of the book the author, a law professor at the time, lays out his case that the Jews had their own commonly-held and communally-run legal system in which they lived their lives, and they did so for two millennia, growing the system and adapting it as needed along the way. The second section deals with what law professors apparently call the legal sources of the system, the legal tools the system uses. Imagine, for a moment, that it’s the 45th century, or the 50th, and you’re living in a United States which still regards the 18th century’s Constitution as its founding legal document. The legal tools are the modes of operation which enabled your forefathers to take that ancient document seriously all along: interpretation, legislation, jurisprudence and so on. As Elon tells it, the Torah is of course the founding document, the source of authority, and being divine, not a letter of it can be amended. Yet amended it had to be for the system to grow with history. And so there were early tools such as Midrash (hermeneutics) which enabled the early legal scholars to derive their legal needs from the immutable text. Elon gives a very fine description of the various forms of Midrash, of which there were quite a few. Interestingly, however, these tools were mostly used by the Tanaim, the scholars who created that tanaitic literature which was then, in the 2nd century CE edited into (or out of) the Mishna. These Tanaim lived mostly in Israel, indeed, mostly in the Galilee, and held their discussions mostly in Hebrew. They were followed by the Amoraim, the creators of the Gemara between in the 2nd, 3rd, 4th and 5th centuries. They tended to be in Babylonia (present day Iraq) except when they were in the Galilee or elsewhere, and they tended to work in Aramaic, except when they used Hebrew. They used much less Midrash then the Tanaim, and indeed, they related much less directly to the Torah, focusing mostly on the Tanaitic literature, in the Mishna and beyond it. They were followed by Savoraim and then Gaonim, which takes us till about the 10th century. The later in time, the greater the likelihood not to use Midrash, but to prefer decrees (a type of legislation – did I mention that the Jews never had a legislature throughout this 2,000-year period), then local decrees, binding traditions, precedents, and some forms of deduction. As the 2nd millennium began, the center in Iraq lost its luster and its hegemonic power, never to be replaced (until the 20th century?) From then on there were a series of centers, sometime even more than one at once; they all seem to have known of them all at any given moment, and communicated to the extent it was practical. As time went on, the local decrees and traditions took on greater significance – but as the persecution went on, local practices became less likely to be helpful in new communities of Jews from diverse old ones. None of which ever threatened to destroy the system, astonishingly. A significant reason for this startling cohesiveness can be found in the third section of the book, where Elon describes the documentary sources of the Jewish legal system: the texts. He harks quickly back to the Torah, Bible and Talmud, but spends most of his time on what came next, from the 9th century on. The central theme of the story is the codifiers vs the interpreters. The interpreters came in a number of flavours, those who saw their task in explaining the earlier texts, and those who worked through all the earlier texts to provide a legal ruling on particular matters. (Rashi being the single most important interpreter, and the Tosafot providing rulings – though neither of those examples is clear-cut). Then there were the codifiers, the scholars who saw the immense (and growing) literature and its extreme complexity, and tried to force order and simplicity on it all in one fell swoop, so to say. Actually, there was only one scholar who tried to impose complete order on the complete corpus and in one fell swoop so s to serve as the final word on the matter, and that was the Rambam, Maimonides, in the 12th century (who also happened to wander the entire length of the Mediterranean as he tried to sidestep his persecutors). He was so gigantic a figure, so totally a genius, so far ahead of everyone else, that he felt he could carry off the trick; and no sooner had he done it, in his 14-volume Mishneh Torah codex, than a choir of his contemporaries and their disciples for the next few generations all tore into him for his arrogance and presumption, recognizing his intellectual superiority over them as they did so. Or did the codifiers really win? I’m not so sure. One of the oddest parts of the story is that while the cutting edge of the system of Jewish law kept on moving forward, as cutting edges tend to do, the single most important layer was and remained the Talmud, until this very day. The Rambam’s presumption to have his work enable the complicated Talmud to be superseded may have happened on the level of legal ruling; but there are 100,000 students of Daf Yomi today, not of the Daily Rambam program (which does exist, but is a pale shadow of the main show). Where does all this lead us? Beyond being a fascinating yarn and a crucial insight into what made Jews tick? Near the end I found myself with a number of reflections. First, there’s the miraculous mystery of Zionism. Just as the legal and social and cultural tools which maintained the Jews for 2,000 years were being broken down by the modern conception of the individual facing the State without an autonomic community in the middle, as well as by the tidal wave of secularism which detached a majority of Jews from the traditional ways and texts, along came Zionism and replaced the magnificent-but-worn old tools with a whole new set. Just as the intellectual ferment which lasted millennia was finally (largely) exhausting itself, along came Zionism with a whole new context in which to live full Jewish individual and communal lives. (I’m writing this on the evening of Yom Hazikaron, Memorial Day, so I’ll add that Zionism also gave, and demanded, a new set of reasons and contexts in which Jews lay down their lives for the nation). Even on a less grand scale, Elon’s book itself demonstrates how the Jews have developed alternative ways of studying their rich cultural heritage: no one prior to the 19th century would ever have thought to write a history of the Jews through the history of their legal development. Finally, the archivist and information-professional in me looks at technology. Just about the exact moment when Elon was publishing his book, a group of scholarly computer-scientist types were banding together to put the entire gigantic sprawling Jewish legal library into a database, now known as the Bar Ilan project – an invention the Rambam and his fellow codifiers would greatly have appreciated if had they ever been able to conceive of it, which they of course weren’t. For whatever reason I seem to have a spot of time for blogging (see yesterday's post, and today's. I also recommend this older post, as we approach Memorial Day). So perhaps I ought to use the moment to tell about what's happening at the Israel State Archives (ISA), since my move there was what caused me to (mostly) stop blogging. In the past few years the Cabinet has passed a series of resolutions about the ISA. The most significant was last November, when Cabinet Resolution 911 essentially redefined the goals of the ISA to fit the needs of the 21st century, while also allocating a significantly enhanced budget to be able to reach them. This is a long-term project, starting in 2015 and scheduled to last 15 years, i.e long after the end of my term (senior officials have term limits in Israel). Until the advent of 2015, we're already up ramping up via the previous resolutions, which began allocating new funds in late 2012. Almost none of what we're doing will be visible to the general public before summer 2015 at the earliest, and some of it will require many years. Fundamental change on the scale we're enacting takes years and years to work its way towards fruition. So if you go visit our website, for example, you'll see the same 18-century version that's been there all along; even if you visit our reading room, the most that will happen is that you'll hear rumors about rumbles. The first project we started was scanning the existing paper collection. The reason we started there is that, contrary to what folks think, a scanning project is a low-tech operation, 95% of which is logistics, and 4% of which is purely technical. In 2013 we scanned close to 20 million pages plus ten of thousands of photos; at that rate we should complete the entire scanning project in about 40 years, give or take a few. We also began planning and developing a new main software system, to replace the existing one which was developed in the 1990s. This is very much a high-tech operation, at which many of us are working very hard. Once completed, perhaps in January 2015, we'll have abilities that will be far advanced over what we currently have, but it will still be entirely invisible to the general public. Also, such projects are never "completed"; development goes on for as long as the system can contain it. Eventually the patches required grow larger and more complex than the system itself, and then it's time to move to the next new system - but hopefully that doesn't happen more than once in 15 years. We're working on revamping the method (and also a bit of the legal context) of how declassification is done. There's an embarrassing backlog in that field, and I'm happy to say that the Cabinet agreed that it had to be dealt with. Again, right now we're planning, developing methodologies and capabilities; the real breakthrough can't happen before those new systems are in place (see previous paragraph) in early 2015. The public won't begin to benefit until a later date - but that could be late 2015, maybe - not that long from now. We're just about to begin deploying some new ideas and capabilities about how we transfer digital data from government ministries to the ISA. Since documentation doesn't get opened to the public for 15 years, this won't make a difference anyone notices for quite a while - but once that while comes, it will make all the difference. So it needs to be worked on now. If everything goes according to plan, we should take down the 18-century website in about a year from now, and replace it with its great-great-great-grandchild. On the other hand, nothing ever goes according to plan, so don't hold your breath. So those are some of the more obvious things that are happening. There are also a couple of smaller tracks we're moving on, such as writing a new draft Law of Archives to send to the Knesset, and a new system of knowledge management to accompany the collections of documents and make them more generally accessible. Our staff is training itself to do most things differently than they used to, and it's encouraging to see them do so with commitment and determination. We're going to expand the staff, too, once we find the 5 minutes to write up the new job descriptions. Our intention is to have a revamped ISA public presence later this decade, with the documents of the State of Israel easily accessible online. We're on track, but it will take time. The United States is by now one of the oldest democracies in the world, and still using its original constitution. Yet it actually hasn't been around very long. This point was impressed upon me recently while reading Stephen Ambrose's last book, the excellent Undaunted Courage: Meriwether Lewis, Thomas Jefferson, and the Opening of the American West . In the tone of a master storyteller, Ambrose relates a story everyone knows something about, and makes of it a page-turner. It's the story of how President Jefferson prepared his aide Meriwether Lewis to go and find out what lay to the west of the Mississippi River, all the way to the Pacific Ocean, and to bring back as much diverse knowledge as possible: about geography, botany, zoology, about the Indians, about the English, the French and Spanish presence in the area if there was any, and anything else of interest. Since no white man had ever been in the area and reported back, everything was interesting. So Lewis recruited his friend William Clark, and together they created a unit of soldiers and others, never more than a few dozen in all, and off they went. They set out in May 1804, and got back in September 1806. Ambrose wrote his book a few years before the bicentennial anniversary, and even today we're only 210 years behind them. And that's the first startling thing about the story. As recently as 200 years ago, if you floated down the Ohio River west towards the Mississippi, you were surrounded by hundreds of miles of pristine forest, with, here and there and at great distance from one another, a rough stockade or a one-street trading station with maybe a few hundred locals, all of whom had arrived there in recent years. Cincinnati was a really big city (but did it have more than a thousand people? The book doesn't tell), and it had been founded 15 years earlier. And the area east of the Mississippi was mapped, known, and part of the United States. Seen from the perspective of where Lewis and Clark were going, it was civilised and tamed. Pretty soon it would even be boring and unattractive for the pioneering spirits who were escaping the stifling civilization of the Eastern seaboard into the unknown and untamed frontier. They didn't have Whatsapp in those days, and Facebook was unreliable. As a matter of fact, as Ambrose reminds us early on, the the only type of communication anyone had ever dreamed of which was faster than a man's pace of walking, was if he was on horseback. Which means that from the day in May 1804 when Lewis and Clark started upstream from St. Louis (pop. 1000), they were out of contact. Once or twice in the coming years they sent back a few messengers, whom they never saw again and could only hope would arrive back in civilization; they themselves heard nothing from civilization until they appeared one fine September day back in St. Louis, two and a half years later. In the interval they lived off the provisions they'd acquired in advance, and mostly, they lived off their wits and off the land, essentially reverting to hunter-gatherers. They were very good at being hunter-gatherers, but they'd also chosen a good place. The descriptions of the bountiful land they were moving through are, simply, astonishing. Much of the area is still bountiful, indeed, it's the breadbasket of the world, but it's tamed and controlled by humans. It was different 200 years ago. So they made their way all the way to Oregon (which wasn't yet called Oregon), took a selfie on the coast of the Pacific, and walked back, proving that it was all there, that area, that there wasn't a combination of big navigable rivers that crossed it, and discovered a few hundred species of plants and critters previously unknown to the taxonomists. Lewis opened by advising the warriors to be wise and look to the true interests of their people. "Children", he continued, as Clark recorded his speech, "we have been sent by the Great Chief of the Seventeen great nations of America to inform you... that a great council was lately held between the great chief and your old fathers, the French and Spaniards". There it was decided that the Missouri River country now belonged to the United States, so that all those who lived in that country, whether white or red "are bound to obey the commands of their Great Chief the President who is now your only great father". (P. 156). And from there on the speech got worse. That passage made me stop and think for a moment. In 1804, more than 90% of recorded Jewish history (so far) had already happened. More than 1,500 years of the interval between the collapse of the (western) Roman Empire and the rise of United Europe (such as it is) had already happened. The French Revolution was already history, and Napoleon was wandering around Europe causing uproar. Shakespeare had been dead almost 200 years. Jerusalem, considerably older than Cincinnati or even Virginia, was at one of its many lowest points, but had only a few decades left before it would begin growing beyond its walls, and with a Jewish majority. 210 years is a long time if you're building a family tree, but in terms of history, it's just yesterday. And just yesterday, the first organized white man ever to reach Iowa was preaching at the locals in terms that no kindergarten teacher would use today without blushing. All he was doing was preaching; the really bad stuff was yet to come. As Ambrose notes later in the book, the entire process of the western-moving pioneers regarding the Indians was simple: move out of our way or be killed. Since being in the way meant being on the continent, that left only the option of being killed - and indeed, they're effectively all gone. Everything I read, I read with an Israeli perspective. Sorry, that's just who I am. The earliest proto-Zionist settlements were started in 1878, and they picked up speed in 1882. The distance in time between Lewis and Clark, first explorers of the western half of the United States, and the advent of Zionism, was 80 years. The final subduing of the American West (sometimes called the Closing of the Frontier) and early Zionism were, quite literally, simultaneous events. The original population of the United States are gone - gone from Massachusetts these past four centuries, but gone from the western half of the country all of, what, 150 years? Less even than that? Meanwhile, in Israel alone there are more Arabs today than there were in the whole country in the late 19th century. Next time you hear an American enemy of Israel speechifying about the evils of invading someones land and then stealing it, too, ask them what their opinion is of Missouri. Or Oregon. Because it's the same time frame. Or, if you'd prefer to simply read a book with a great yarn about a world that's gone, read this book.